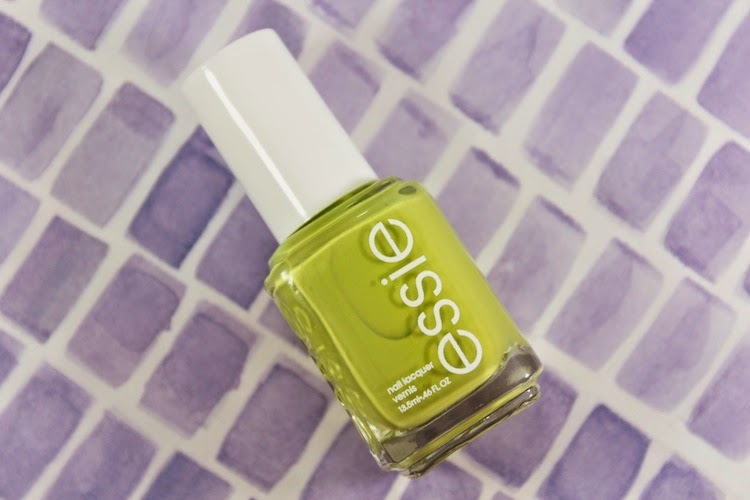 Another polish from Essie's Summer 2013 Collection called The More the Merrier. It is a bright mix of lime green and chartreuse. While I love the colour in the bottle, I'm not sure how I feel about it on my nails. It's a fun colour and somewhat unexpected. I'm always seeing this colour in accessories and costume jewelry, but I've never thought to wear it on my nails. In terms of application, the creamy formula, while a little goopy, was opaque and even in three thin coats. It also has a fairly glossy finish without a top coat. While I'm glad I picked it up, I'm not sure how much use I will get out of it. Perhaps it's better suited as an accent colour to a deep pink polish? I find that this is an amazing color for the summer because it would look great with a tan!! But you are right I dont know if it would work with me!! it's one of those "pretty-ugly" shades. personally not for me. On a sidenote this looks EXACTLY like CoverGirl's Appletini from the Glosstinis collection!